Photos and graphics by Holly Li. When Eric Mu says that the village of Moyu, in western Sichuan, is remote, he means it. Culturally more Tibetan than Han, the tiny settlement sits in a valley among soaring mountains and deep gorges. The village is only connected to neighboring communities by a rickety suspension bridge, which wobbles above river rapids below. Mu crossed it once. He’ll never cross it again. It was terrifying, he says. Life in Moyu is slow. When Mu is there, he runs – passing along winding roads and through tunnels that pierce the mountains, some as long as 3 kilometers. His coworkers entertain themselves with mahjong and smartphones. Some of the villagers grow corn. Industry in Moyu has also been slow. A hydropower plant was built years ago nearby the waterfalls that crash down from the steppe. The plant’s engineers had hoped to sell their hydropower to the national grid, but demand wasn’t as high as they’d projected. The plant made barely enough money to pay staff wages. So when Mu’s employer, HaoBTC, pitched the idea of building a bitcoin ‘mine’ that would run on the town’s ultra-cheap hydroelectric power, local reception was positive. It didn’t matter that the managers at the plant had no clue what bitcoin was. It was bringing money, and it was bringing jobs. Local government officials were pleased. 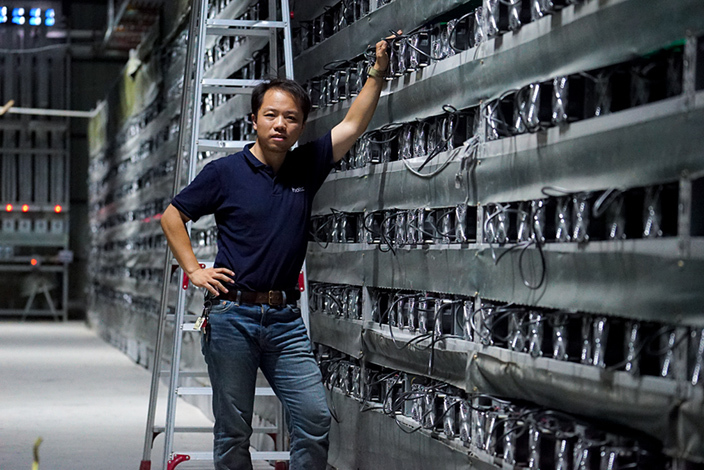 Eric Mu stands inside HaoBTC's mine in Moyu. Because while the industry surrounding bitcoin – or the “currency of the Internet,” as Mu puts it – is global, China is taking the lead. functional and secure. These volunteers are the miners. 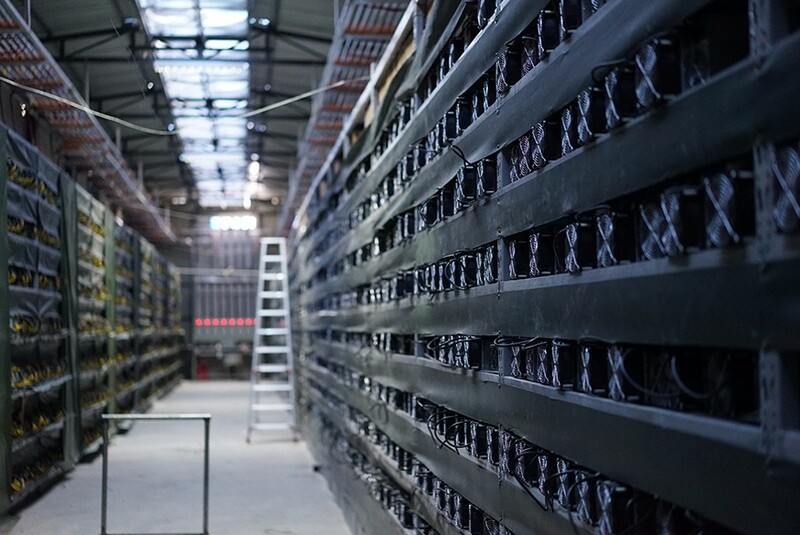 The blockchain system provides an incentive for miners to mine: Each day, it releases a certain number of bitcoins and distributes them proportionately among users based on the amount of computing power they have contributed. In short: The more power you have, the more bitcoins you’ll receive. For miners, it’s a simple equation: The faster the computers and cheaper the electricity, the higher the profit margin. “People keep buying more and more machines, and they’re getting larger and larger,” says Mu. HaoBTC is no exception. Chinese companies mine more bitcoin than any others, and HaoBTC accounts for 5 percent of global mining, according to the online bitcoin resource blockchain.info. Sharma’s employer, Bitmain, also runs mines across the world – in Canada, Iceland and China. 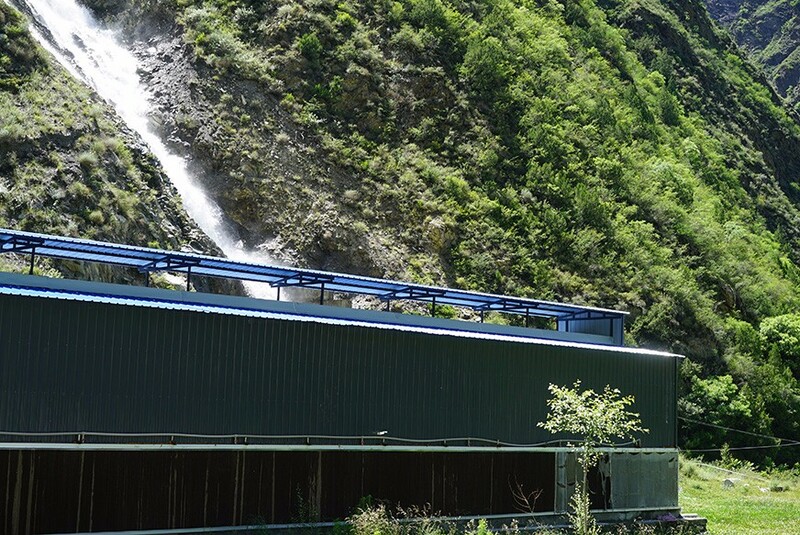 Sharma says his company originally invested in places where coal was cheap – primarily Shanxi and Inner Mongolia – but later shifted to hydropower in the Western mountains like HaoBTC did. But in Beijing, where the company is based, Bitmain operates a website that sells the most advanced bitcoin mining computers on the planet. “Nothing in the world has that kind of computational power,” says Sharma. But mining isn’t the only way Beijing’s businesspeople are profiting from cryptocurrency. The world’s largest bitcoin exchange, OKCoin, is also based here. There are hundreds of exchanges that allow partipants to buy and sell BTC in different currencies worldwide, but OKCoin currently carries out more daily trade than any of them. At the time of publication, OKCoin had facilitated more than RMB49 billion’s worth of bitcoin trade in the 30 days prior, according to industry statistics site bitcoincharts.com. Chinese bitcoin traders outnumber their counterparts in other countries by a staggering margin. Currently, 93 percent of all bitcoin trades are with renminbi. And OKCoin accounts for 76 percent of these transactions. While Bitcoin’s value fluctuates more than most currencies, it has become more valuable in recent years – rarely dipping below USD300 per coin since 2013. Many Chinese bitcoiners both invest in the currency and trade it. One person who profited from the trade is Neil Woodfine, who was working in China after graduation when a friend sent him an article about bitcoin. With a bit of money saved in the bank, he decided to invest – just two days before the now-famous 2013 price jump.“[My investment] went from 190 US dollars all the way up to 1,200,” he says. “By the end of that month the price started to crash down again, but I was already completely obsessed, so it didn’t matter.” Later that year, Woodfine got a job at OKCoin. Today, Woodfine runs Remitsy, a Beijing-based startup that makes it easier and quicker to send money abroad by using bitcoin. The network Woodfine refers to is SWIFT, the bank-sanctioned system traditionally used to send money abroad. SWIFT’s international payments can take days or even weeks. With bitcoin, they take minutes. Remitsy’s offices are testament to this. 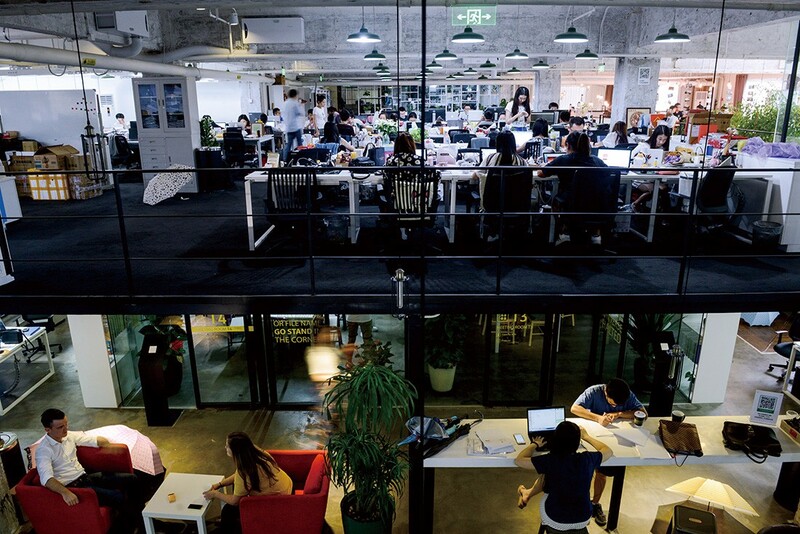 Woodfine rents desks for his small team in Tech Temple, a co-working space in downtown Beijing that offers cheap office space to hundreds of tech-minded entrepreneurs. On workdays, the space hums with activity – and by ‘activity’ I mean young people in T-shirts and jeans typing furiously at their computers. On my first visit, the music at the in-house cafe is so cinematic that it seems like it is intentionally soundtracking entrepreneurs’ ambitions. Woodfine’s own ambitions have a certain flair. He’s a skilled orator when describing his company, regularly pounding his fist on the table for emphasis. It’s clear that bitcoin entrepreneurship isn’t just something he’s been talking about for a long time – it’s something he’s passionate about. Outside of Woodfine’s (very long) work hours, he runs an English-language bitcoin meet-up alongside Mu, which gives him the chance to talk to bitcoin enthusiasts who work outside the industry. In Beijing, he says, bitcoin is becoming more mainstream. He’s right. In the course of reporting this story, local entrepreneur Brendan Gibson, a friend of Woodfine’s, convinces me to download a virtual wallet (read: iPhone app). To see how the process works, I download Blocktrail from the App Store. Within five minutes, Gibson has sent me BTC0.0060 (RMB23.50). Each bitcoin is infinitely divisible, and at the time of publication, one bitcoin was equal to RMB3,858.33. Unlike Woodfine, Mu or Sharma, Gibson does not work for a bitcoin exchange or mining company – he’s just an enthusiast who believes in the currency’s promise of institution-free banking and anonymity. And in his own, non-corporate way, he’s raising awareness of its benefits. Gibson’s distrust of banks stems from the 2008 financial crisis, when he was working in home loans at Bank of America. “I was part of that mortgage crisis, front and center,” he says, over lunch in Beijing’s hutongs. Gibson’s online businesses accept bitcoin, and on a recent trip to Spain, he used a special debit card that allows him to spend bitcoin wherever Visa cards are accepted. But regular bitcoin spenders are still rare in China, where many places don’t even accept credit cards – let alone virtual currency. It’s still wildly impractical to buy your coffee with it. As Chief Strategy Officer of OKCoin, Jack Liu is invested in investing. But to Liu, there’s much more to the currency than that. Over the past three years, Liu has helped grow OKCoin into China’s largest bitcoin exchange. Today, however, he’s looking to the future. At OKCoin’s Beijing offices, just north of the famed universities of Haidian and the startup hub of Zhongguancun, some of the most forward-thinking innovation in the global bitcoin industry occurs. 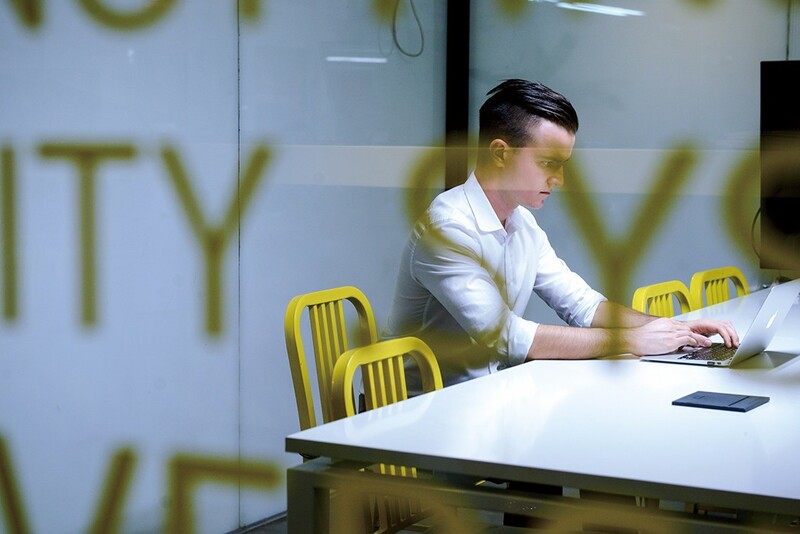 “We view the blockchain as a trust machine,” says Liu, explaining that blockchain technology would enable the OKLink team to connect financial companies “behind the scenes” – resulting in a platform that would serve as a faster, easier alternative to SWIFT. Beijing has a historic opportunity to lead that revolution. I ask Liu about the city’s potential. Liu is visionary, but also intensely meticulous – pausing and re-explaining concepts, intent on me fully understanding blockchain’s potential to revolutionize finance as we know it. I’m amazed to learn he’s only 28 – even though under-30s are common in this ultra-young industry. Ultimately, it’s this optimism toward the future that keeps Beijing’s bitcoiners going. Mu has now made three trips to Moyu, the longest of which lasted three months. When he’s home in Beijing, he works at HaoBTC’s Haidian offices, hangs out with his laptop at The Bookworm and runs meet-ups alongside Woodfine. The mining doesn’t stay in Sichuan. Mu runs a tiny mining operation, with just one computer, in his home. It’s not remotely on the scale of HaoBTC – it’s merely an experiment, something he does for fun. HaoBTC will have to replace its computers every year if it wants to keep up with the pace of development. For Mu, that means more trips to Moyu, and a couple weeks after our chat, that’s exactly where he is. 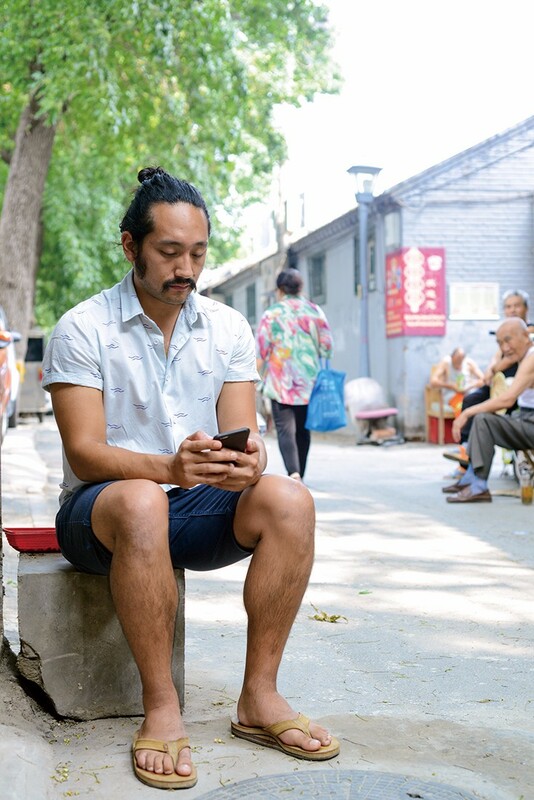 “I think a two-week retreat away from crowded and polluted Beijing is still nice, despite the noise and isolation,” he writes in an email from the village. In Moyu, he’s a far cry from the tech hub – and the bitcoin hub of the world – that is Beijing. But that’s OK. For Mu, this isn’t just a job; it’s a passion. “In my old job working as a media researcher, I didn’t see any future. I saw a dead-end. But this space is so new and so unpredictable,” he says. 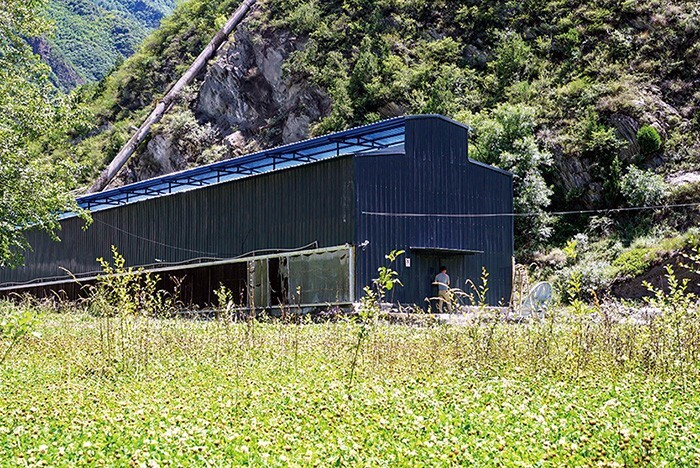 Photos of Moyu mine provided by Eric Mu. 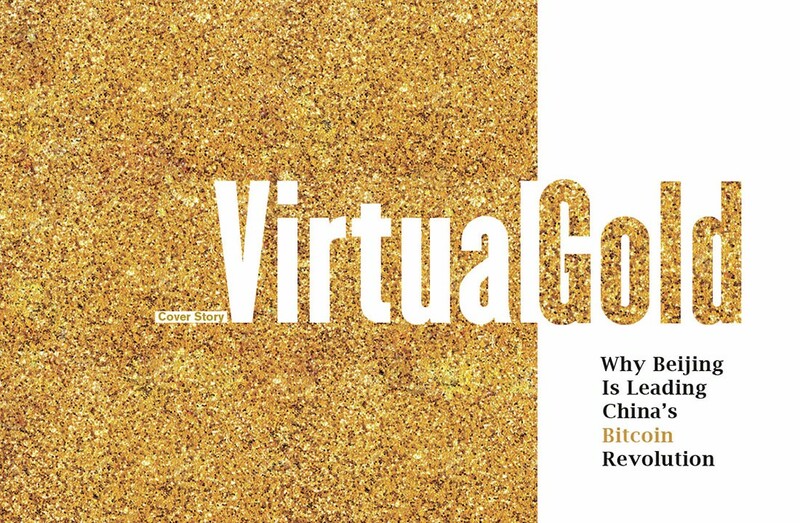 An earlier version of this article implied that Bitmain sells mining computers from its Beijing headquarters. Bitmain sells via its website. Can China position itself as a blockchain development hotspot? Coin Toss: What Happened to China's Bitcoin Boom? China was once home to the largest, most powerful bitcoin exchanges in the world. 2016 China News Quiz: Do You Remember the Top Stories? Test your knowledge of 2016 China news with our quiz! Have you been paying attention to what's been going on in China this week? Test your knowledge of China's biggest stories this week with our news quiz.